Last week I spent some time helping our 2-year-old stud colt, Archie, learn to back off a trailer. I taught Archie to trailer load when he was about six months old, so we could trailer him to vet and farrier appointments. He loads with no issue and seems perfectly relaxed riding in the trailer. However, he absolutely refused to back off the trailer. That big backwards step off a sheer drop scared him to death and no amount of coaxing would convince him to try it! Archie is currently small enough, and our 3-horse slant trailer is larger enough, that it has not been a big deal to simply let him turn around and unload forwards. However, at some point he needed to learn to back off. The issue was lack of confidence. Stepping off backwards into an unseen abyss is scary business. I feel the same way reaching blindly for a ladder rung to climb off a roof. Archie lacked confidence in his own ability to back off the trailer…and he lacked confidence in me instructing him to back off the trailer. So, last week we spent some time doing confidence building exercises. I started by backing Archie down the pond levy. Once he was able to back down the steep embankment without too much hesitation or dodging sideways, we moved over to a concrete slab where we first backed off a 2 inch drop on one end, then backed off a 5 inch drop on the other end. Once he was acting fairly confident backing off the slab edge, we moved inside the trailer. I was so proud of how well he backed off the trailer! He did great! All he needed was some smaller steps to build his confidence to help prepare him for the big scary trailer edge. I totally get it! I often struggle with confidence issues, too. Over this past year I’ve been working a lot with our 5-year-old gelding, Knockout. When I first started working with Knockout, he was a very frightened young horse who spooked at everything and was ready to bolt at the drop of a hat (literally). Over time, his confidence improved to where we were doing trail rides together and hauling to different arenas to expose him to more environments. Then I decided to take Knockout on our Spring Break family vacation for a week of trail riding in the Texas Hill Country. This was a big test! It would be Knockout’s first exposure to a lot of new things, including group trail rides over steep rocky trails through mountainous terrain. To prepare Knockout, I had him shod and began riding him on the gravel roads near our house. At every opportunity, I threw a saddle bag with a couple of water bottles behind his saddle and we set off to explore the country roads and trails together. 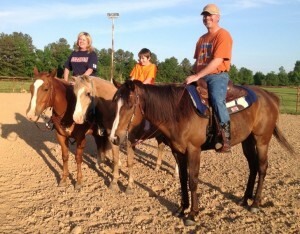 While riding those trails, we practiced transitions, stops, and departures at walk, trot, and lope. We practiced side-passing, turns, and laterals. 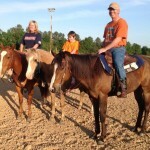 Through that trail riding training, Knockout and I began to really work as a team. I became more confident in our ability and he became more confident in me as a leader. As the scheduled vacation approached, I told my wife that although I wasn’t positive we would have no issues, I felt confident we would not encounter any issues we could not overcome together. Spring Break arrived and Knockout did great! He took to the mountain trails like an old pro, calmly leading through dense forest cover on narrow trails and calmly following over steep rocky grade. When leading, he stepped out on a long swinging walk on a loose rein, without much trouble. When following we kept a decent space between himself and the next horse, slowing to match the leading horse on a loose rein. But there was this one incident…this one scary incident. It wasn’t Knockout’s fault…it was all on me. 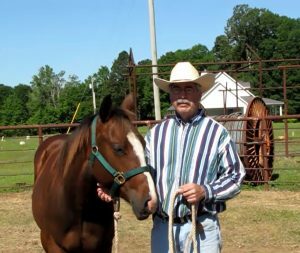 It involved loping my young horse with other horses while he was carrying heavy full saddle bags…and the heavy saddle bags flopped up and down in rhythm with his loping…miscuing him to a faster pace. It had to do with my totally forgetting the saddlebags were even there. It had to do with my totally misreading the situation…and subsequently mishandling it. It had to do with my own fear of out-of-control speed. Misunderstanding Knockout’s miscue…thinking he was a totally panicked runaway for no reason…responding in fear, myself…I bailed off. I was wearing a helmet and I wasn’t injured…just a few minor scrapes from the coarse prairie grasses. Logically, I explained to myself how none of this was Knockout’s fault…which I knew to be true. Logically, I reasoned that the same could have happened with any horse. Logically, I consoled myself that it was a simple error on my part that was perfectly understandable…especially for a novice horseman. But emotions don’t concern themselves with logic. Over the next few weeks, I continued to ride. However, all my rides stayed within the constraints of our arena…and stayed at a gait of walking or trotting. I didn’t ride outside the arena and I didn’t lope. Each ride I would tell myself this time I was going to lope…and each ride ended for one reason or another without a lope actually occurring. Eventually, I had to admit to myself that, yes, I was avoiding speed. And the worst of it was, I know my horse tends to respond to my emotions. When I’m unsure he’s more likely to be unsure…more likely to spook…more likely to bolt…which is exactly what I was scared of to begin with… Yikes! Talk about a downward spiral of negativity! Then I began training Archie, the 2-year-old…and I thought about Archie’s confidence issues and how we overcame them. I continued to work with Archie on things that were new to me. I continued to work with Knockout on familiar transitions, stops, departures, and laterals at a walk and trot. Finally, this past Saturday, I was working with Knockout in the arena at a fast trot, when he spontaneously rolled up into a lope…and I resisted my instinct to tug back on the reins…forced myself to keep the reins loose. We loped two or three big circles…and I relaxed a bit. Then I asked for a stop by sitting deep in the saddle (still with loose reins) and Knockout responded with a big sliding stop and two steps back. Then I asked for a canter departure…and followed that up with about 20 minutes of practicing transitions at walk, trot and lope. I was elated! I realized Knockout was still the same horse he was before the saddlebags incident. I had lost confidence in us…Knockout had not. The next day, Knockout and I rode the gravel roads near our house again. Confidence is a funny thing. It takes time and effort to gain confidence, yet confidence can be lost in an instant. Lack of confidence can be paralyzing. So how do we regain confidence? By intentionally testing the relationship in small things. For Archie, that meant learning to back down slopes and small steps before trying the scary trailer edge again. For me with Knockout, that meant working with Knockout on smaller things while I rebuilt confidence in my leadership and in his response, before tackling my fear of speed head-on. As Knockout continued to prove himself faithful in small things, my confidence grew. Some of those life events hit me hard, shaking my confidence. Some temporarily shook my confidence in God and His love for me. Others shook my confidence in my ability to hear God’s voice…or my ability to correctly interpret scripture…or my ability to wisely discern a situation or relationship. So how do we overcome a loss of confidence in these larger life issues? The same way. We test the relationship in small things. We spend time with God. We follow His direction in small things and witness His faithfulness…as we learn to trust Him in the big things. Know therefore that the Lord your God, He is God, the faithful God, who keeps His covenant and His lovingkindness to a thousandth generation with those who love Him and keep His commandments (Deuteronomy 7:9). Let us hold fast the confession of our hope without wavering, for He who promised is faithful (Hebrews 10:23). Have you ever lost confidence? How did you regain it?